Launch of the new 2019 Tata Tiago facelift is expected to take place later this year. Hat tip to automotive enthusiast Aarav Pooda for sharing exclusive spy shot on Rushlane Spylane. There is a new 2019 Tata Tiago facelift in the works, as latest spy shots reveal. The mid cycle update for the Tata Tiago compact hatchback will not only include cosmetic and feature updates but will also see added safety gear, offered as standard, to comply with new safety regulations being made mandatory from later this year. The new Tiago will also see changes in its overall structure so as to clear new crash test norms coming into effect from October 2019. Tata Tiago has been on sale since 2016, bringing in good sales numbers each month. However, with these new regulations coming into effect, Tata Motors is working on the updated Tiago, though launch date has not yet been revealed. 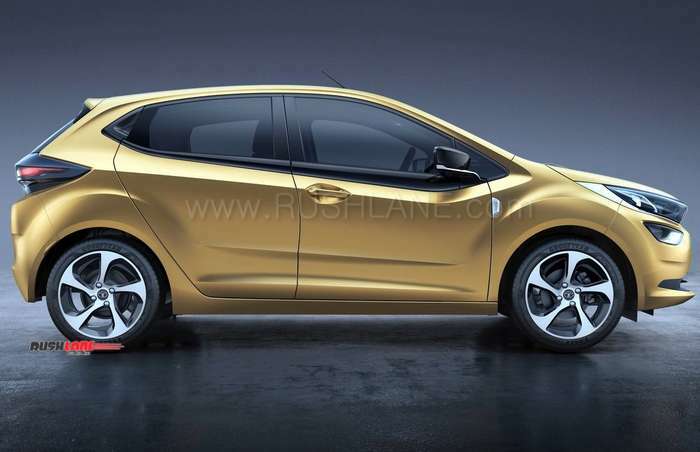 Latest spy shots via Rushlane Spylane, confirm that the new Tiago will get front face inspired by the Altroz. 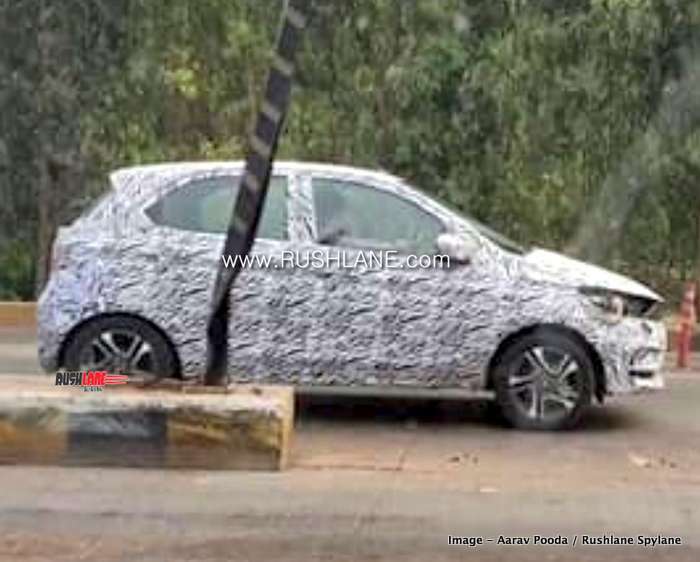 2019 Tata Tiago test mule was seen testing in Pune recently by auto enthusiast Aarav Pooda. The new design borrows inspiration from the yet to be launched Altroz hatchback. It will get body colored ORVMs, while modifications could also include new front and rear bumpers, dual tone alloys, smoked headlamp unit and a new front grille. Interiors could also see some changes. Along with updated upholstery and new colours, it could also get more equipment like new Harman sourced touchscreen infotainment system, with Apple Carplay and Android Auto compatibility. Safety features will also be updated and offered as standard across all variants. These will include ABS, EBD, dual airbags, reverse parking sensor, speed sensing auto door lock, speed alert system and seat belt reminder. Below is a side view photo of Altroz for comparison. Tata Tiago is currently offered in two engine options that include a 1.2 liter Revotron, 3 cylinder petrol engine and 1.05 liter Revotorq, 3 cylinder diesel unit. The petrol engine offers 85 PS power at 6,000 rpm and 114 Nm torque at 3,500 rpm. The diesel engine is capable of 70 PS power at 4,000 rpm and 140 Nm torque at 3,000 rpm. Both engines get multi drive modes and get mated to a 5 speed manual transmission, while AMT is only on offer with petrol variant. In terms of fuel efficiency, the petrol engine offers 23.84 kmpl as per ARAI, while diesel engine offers 27.28 kmpl. Following these updates and added safety features, 2019 Tata Tiago facelift could come in with a marginal increase in price. The current model is priced between Rs.4.27-6.56 lakhs. Tata could launch the new Tiago with updated front look in the coming months, ahead of Altroz launch, which is scheduled for Oct 2019.